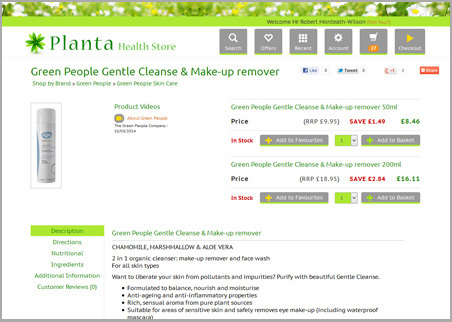 Planta is a London based "bricks and mortar" health store which has been operating an online shop since 2006. They had a lot of success with their website when it first launched but growth has been an issue since their original web site stagnated and became outdated. With mobile and tablet use fast increasing for making on-line purchases it was essential that their new website be fully responsive and touch-optimised. They also required that it have personality and look professional but at the same time avoid giving the impression that the products are likely to be expensive. They operate in the health supplements market which is highly competitive. Discounting is rife so to compete in that market it is essential that discounts are given to shoppers on all products and a lively special offer programme is operated. The web site has to emphasise the discounts available as well as have complex special offer functionality, such as money or percentage off combinations of products, or free products with combinations of products purchased. The web site owner is able to apply monetary or percentage discounts to individual products or whole product ranges with one click. They can also operate their special offer programme easily, choosing from a complex range of special offers with individual products or product groups, scheduled with start and end dates. Their website includes a bespoke back-office system from which they can manage customers, orders and products as well as produce sales and other reports.